Versatile back Tiernan O'Halloran became Connacht's first ever try scorer in the Heineken Cup history, against Harlequins in November 2010. 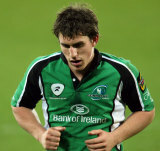 His form during the early stages of the 2011/12 season earned the former Ireland Under-20 international a new contract with Connacht and an invitation to training with the Ireland squad ahead of the Six Nations. He was included in the squad for 2012 autumn internationals after scoring two tries in six appearances in the RaboDirect PRO12.